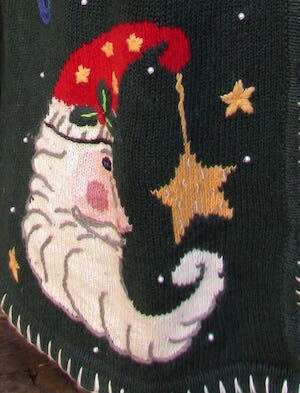 (mens 2XL) Ugly Xmas Sweater Cardigan, Crescent Moon Santa, Stars, Pearly Beads! Home > Ugly Christmas Sweaters > mens MED Ugly Christmas Sweaters > (mens 2XL) Ugly Xmas Sweater Cardigan, Crescent Moon Santa, Stars, Pearly Beads! 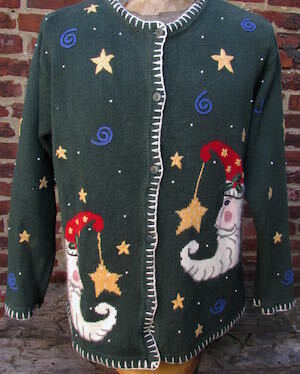 Vintage Ugly Christmas Sweater Cardigan! Green knit with embroidered Yellow stars, Blue swirlies and adorable crescent moon Santas with little Gold stars dangling from their hats! Pearly beads all over the front and sleeves. Totally adorable! One Santa on the upper back. Six Green plastic buttons down the front. Stars and swirlies on the sleeves as well. White detail along the cuffs, collar, placket and hem. Tagged by Quacker Factory. Ramie/Cotton.